During high season every Wednesday gathering wood with all children, a ride on the tractor, making a camp fire and burning marshmellows. The activity of the week! Besides this the children can enjoy themselves in the swimming pool and on the trampolines. 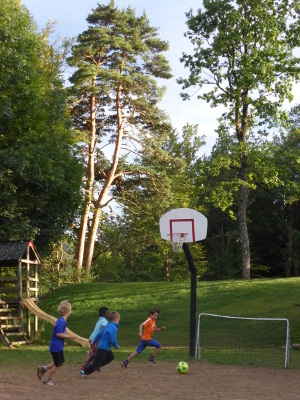 Spontaneous soccer, basketball or volleyball games are organized by the children. Adults prefer to play jeux de boules. Also during high season a barbecue is organized every Friday evening. This is the ideal evening to meet other camping guests and an opportunity to make new friends. The barbecue is by advance registration and will only take place if there are enough participants. Would you like to organize your own event, we are willing to help you. In prior years children organized scavenger hunts and tournaments. On the camp-site and in the surroundings there are a lot of possibilities to swim en to enjoy various water sports. Please click on the link for more information. There are hiking, (mountain)bike and running tracks that start from the camp-site. Tracks are also available in the surroundings. You can climb, ride a horse or walk with a mule in the area. You can also make a tour on a motorbike. You can also do a tour named: "Sidobre, world of granite". Starting point is the Maison du Granit where you leave to the quarry Plô, the ‘goldmine’ like the locals call it. Explosions, drilling machines, cranes, loaders ... it's quite fascinating. This granite quarry is the largest in France. She produces a granite with a remarkable purity and color, whereby the enterprise Plô was commissioned for the tiling of the Champs-Elysées in Paris. Then visit a workshop where the editing and cutting happens. This is the place to see impressive engines, such as the stone saw with a diamond saw blade. With a production of 150,000 tons per year the Sidobre is today’s largest French production centre of granite. It employs about 2,500 people in the industry, in more than 200 companies, of which about 50 are discreetly implanted in the scenic landscape of the Sidobre.